The Meadow Fire on September 7, 2014, during the late afternoon hours. The Meadow Fire was a wildfire which burned areas near Half Dome in Yosemite National Park, California. Park officials believe it was started near Starr King Lake, during a lightning storm, on July 19, 2014. On Sunday, September 7, 2014 the fire forced authorities to order the evacuation by helicopter of dozens of hikers and tourists. On September 16, 2014 the fire burned 4,971 acres (2,012 ha) and was 80% contained. On September 18, the containment of the Meadow Fire increased to 85%, without having expanded further. During the next 4 days, firefighters were able to make significant progress on extinguishing the fire, especially with the 0.25 inches of rainfall during the weekend, and by September 22, the containment of the Meadow Fire had increased to 98%. From September 25 to 26, the containment of the wildfire still remained at 98%, despite some snow and rain falling in the region. On September 27, an additional inch of precipitation helped quench the wildfire, and on September 29, the Meadow Fire was 100% contained. No injuries or fatalities were reported. The damage caused by the Meadow Fire was severe. The high-intensity wildfire burned very hot and, in some areas, the large fir and lodgepole pines were reduced to charcoal stalagmites. The forest floor was slow to recover because of the lack of moisture during the California drought. During the summer of 2015, greenery was scarce and the forest floor was still covered in a thick layer of ash. However, scientists predict that the coniferous forest will regenerate after a few years despite the drought. The Little Yosemite Valley backpacker's campsite is not within the Meadow Fire's burn scar. 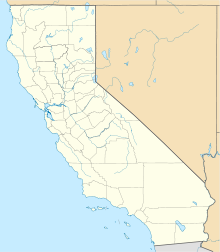 Wikimedia Commons has media related to Meadow Fire (2014). ^ a b c d e f g "Meadow Fire". InciWeb. 19 July 2014. Retrieved 10 September 2014. ^ Aleaziz, Hamed (10 September 2014). "Yosemite firefighters seek to open Half Dome, avoid bears". San Francisco Chronicle. Retrieved 10 September 2014. ^ Wells, Jason (9 September 2014). 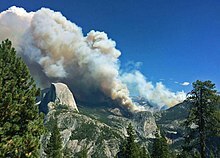 "Yosemite evacuations complete as wildfire rages near Half Dome". Los Angeles Times. Retrieved 10 September 2014. ^ "Yosemite National Park wildfire forces evacuation of hikers – in pictures". The Guardian. 9 September 2014. Retrieved 10 September 2014. ^ "TR: Clouds Rest and Beyond -- April 17-19 -- snow conditions | High Sierra Topix". www.highsierratopix.com. Retrieved 2017-07-13. ^ Dan (2015-07-02). "Yosemite Trip Report, Cathedrial Peaks tailhead to the valley, June 2015". dannix.net. Retrieved 2017-07-13. ^ "Good news: Trees and other foliage have regrown, despite drought". Los Angeles Times. 2016-05-28. ISSN 0458-3035. Retrieved 2017-07-13. This page was last edited on 19 July 2017, at 21:40 (UTC).